What happens to a pile of old leaves outside when you add a dash of time, maybe some worms, and a healthy splash of moisture? Rick soil perfect for a garden just like Daisy's! 1. Rinse the bottle and peel off the label. 2. Cut off the top of the bottle as shown. Set the top aside. 3. Use the nail to punch 8 to 10 small air and drainage holes along the sides and bottom of the bottle. 4. Put the bottle on the tray. 5. 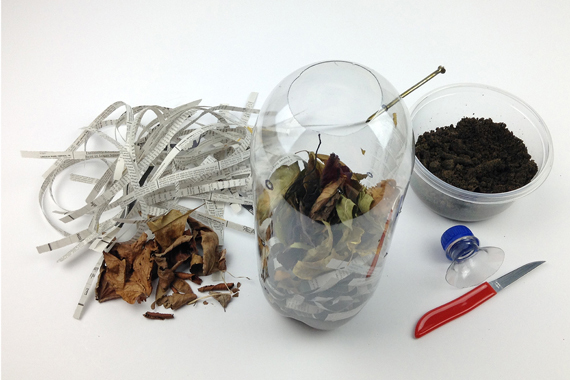 Put some dirt, shredded newspaper and old leaves inside the composter. 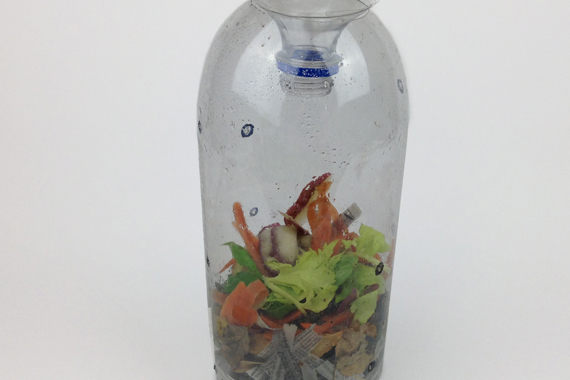 This is your compost starter. 6. 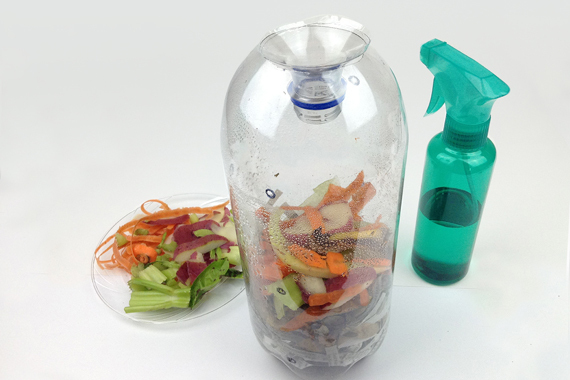 Use the spray bottle to wet the compost starter. 8. Turn the bottle top upside down and next it in the open top of the bottle. It will act like a funnel for adding a little bit of water each day to keep the contents damp. 9. Place in a spot where sunlight can reach it. 10. Stir every few days, keep the contents damp, and let it rot! As your compost breaks down, you can add more kitchen scraps or plant litter, as well as some more soil from outside to mix in. 11. Cover the top of your compost with a kitchen towel when not in use. 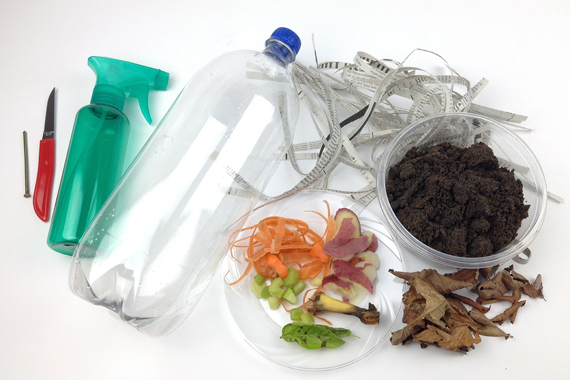 Have you child check the composter each day, describe what they observe. You might see fluffy mold growing -- so keep your compost covered when you're not working with it. Take your rich, healthy soil, place it in a pot, add a seed and some water and grow your very own plant!